Just when you think we couldn't have any more fun, we have one final family Christmas, with my dad's side on the day after Christmas. We never celebrate on the actual holiday, but shortly thereafter, while my brother, John and his wife, Emily are home. Our traditional family photo at the Galer family Christmas. This year was especially hard, because it was the first Christmas without my Grandma Galer, who passed away this spring. But to celebrate her memory, my Aunt Anne picked some of grandma's casserole recipes, and we shared making them. Okay, in our household, Johnny and Emily did the cooking, while Grace and I did the supervising (and eating sugar cookies), but it was still fun to be all together. Uncle Johnny and Aunt Emily work on the cooking. We dodged raindrops on the quick drive to Aunt Anne's, and enjoyed our family meal together, taking in the company and the casseroles. Grace and her cousin, Izzy. After dinner, my cousin Phil's daughter, Izzy, played the piano with Aunt Anne and sang Christmas songs, and it was so sweet to hear her little voice. Her baby brother, Henry got passed around quite a bit too, before falling asleep in my mom's lap. Izzy and Aunt Anne provided Christmas entertainment. Izzy has now taken over one of my childhood roles, that of present-passer-outer. For years, I have helped Aunt Anne pass out all the presents, and this year, I could officially pass on my role to Izzy, who seemed to love opening presents. Grace and her new "Hollywood" sign. Grace and her new Pete the Cat pajamas. Grace got a darling "Grace" sign for her bedroom and some new Pete the Cat gear. Her mommy even got a Pete the Cat shirt too, so we can match sometimes. Cousins Keith and Phil with their new toys. Mom and dad got a new sign for the office. Sometimes, the gifts even get a little silly. My cousins got a remote control cage fighting game, which brought endless hours of entertainment for everyone watching them play. Most people took a turn, but I think Keith was crowned the winner, or maybe Johnny. Sometimes it was hard to tell. Grace enjoyed sitting in her beanbag chair and watching all the festivities around her, and some snuggling with mom and dad too. Christmas is definitely a good time for snuggling. And for family, and we are so grateful for another year with ours. After all the hustle and bustle, it seems hard to believe that the holidays are already here. Fortunately, we had lots of chances to remember the true reason for the season this year. We started our official holiday with a Christmas Eve service at our church. That's been a tradition in my family for years and years. I have learned that over the years, traditions ebb and flow, but I'm sure glad this is one that has stayed. Singing Silent Night with daddy. Family photo opportunity at church. After having an impromptu dinner at my parents' house, we put Grace in her Christmas dress and headed to church for the special candlelight service. It's always a chance to sing some of my favorite Christmas carols, and really meditate on the meaning of the season. I couldn't help but feel blessed for all God has given me in my life as we sang "Silent Night" in a darkened sanctuary, lit only by candlelight. We followed up on one more holiday tradition before heading for home on Christmas Eve, a drive around Tremont Terrace to see the beautiful luminaries. After reading a few of my favorite Christmas stories to Grace, Kyle and I exchanged presents. Somehow or another, we got started our first Christmas together opening gifts on Christmas Eve, and it just sort of stuck. I think we both get so excited about watching the other one open their presents that we just can't wait for Christmas morning. I love that sweet smile when we opened presents. Ready to cheer for her Bison! All too soon, it was time to go to bed in anticipation of the big holiday. Although some days, I wish Grace could wake up early and run into our room excited that Santa had come, it's also nice that she sleeps in some. But after she woke up, we enjoyed cinnamon rolls and opened presents. It's hard to find just the perfect gifts for Grace, but I think we did a great job this year. She ended up with an illustrated copy of the first Harry Potter book, a North Dakota State Bison cheerleader uniform and a wall hanging to display her race medals and bibs. It was fun to help her open her presents and just be together the three of us. Grace and I got matching socks for Christmas. They say "I am amazing." Since our families live so close, we end up with two stops on Christmas Day. We have lunch with Kyle's family and dinner with mine. Although we had seen our families over the holiday season, it was nice to have another chance to visit. At Kyle's mom and dad's house, Grace really enjoyed playing with her cousins, Keelen and Quincy on the floor, and we enjoyed catching up with everyone. Kyle's mom made homemade pizza for lunch, and I think we all ate a bit too much of the holiday goodies! Our family photo keeps growing! After lunch, we gathered around the tree for family photos, and then opened presents. One of the "highlights" with Kyle's family is the random Woot T-shirts he orders for everyone. Kyle even got the honors of best shirt this year. And he was excited to get his own pie for Christmas. Reading books with Grandma Kim. About mid-afternoon, we headed back to our house for a nap. Kyle and Grace snoozed away, and I walked over to mom's for some sugar cookies and visiting. Then we gathered up our stuff and headed back to mom's for dinner when Johnny and Emily arrived from the Chicago-area. This year's menu was soup and sandwiches, and we loved it. None of us even had room for dessert, but we made up for it later. Snuggles with Uncle John and Aunt Emily. Then it was time to open presents, and we had such a fun time watching Grace smile, and trying to get her not to eat her new things. Kyle and Grace got matching Tottenham Spurs shirts, and we all ended up with new shirts for our favorite team, the North Dakota State Bison. Grace and daddy got matching shirts! She's definitely our "Amazing Grace." All too soon, it was time to head for home, hard to believe that the holidays were over once again. We settled Grace into her bed, wearing her new pajamas that matched her American Girl Bitty Baby. She and I read one of her new presents, an illustrated Home Alone book from Uncle Johnny and Aunt Emily. Playing "Jingle Bells" with Grandma Susie. Although the festivities were over, we enjoyed a chance to be together, share laughter and hugs, and enough magic to last us until next Christmas. Just the Sunday before Christmas, we got ready for another family celebration, this time for Kyle's mom's family. They are just about as big as the Hutsons, and it's always fun to be together. 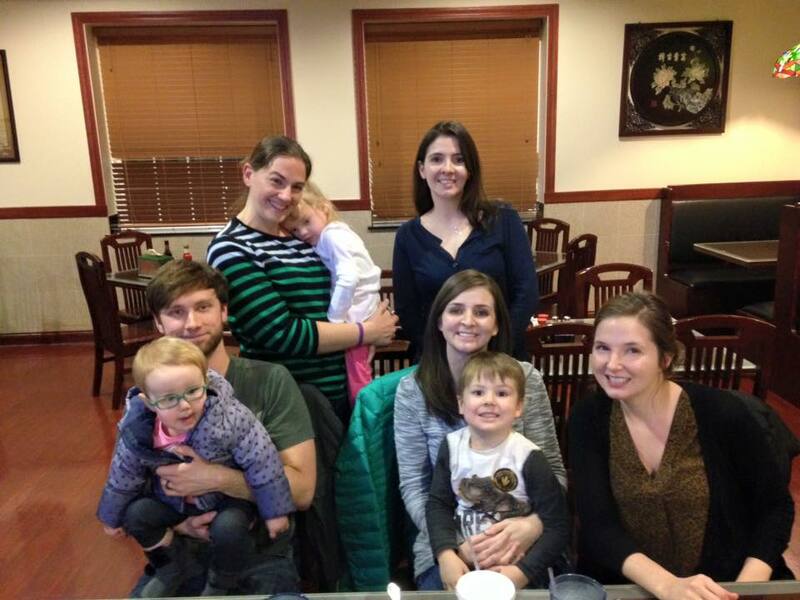 Annual cousin photo at the Armour family Christmas. The celebration used to be held on Christmas around lunchtime, but the last few years has been moved to right before the big day. As the family continues to grow, it seems like more members can come if it's not right on Christmas Day. We feel like we don't end up having to rush around as much. Grace and her daddy show off their taco dip! That Sunday is always cantata Sunday, so we arrived a little after the festivities started, but in plenty of time to have fun with everyone. 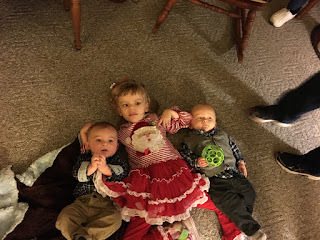 Grace also got the chance to see both of her newest cousins, Quincy and Keelen again, as they were celebrating their first Armour family Christmas. Lunch includes a variety of soups and chili, as well as other long-time family favorite recipes. We brought taco dip in a giant gingerbread man pan. It's sort of become our own tradition, and it was completely gone before we left. Just after we got there, Kyle's Aunt Kim gave Grace a turkey medal from one of her races in November. She said she thought it was fitting since we kept calling Grace our "Little Turkey" around Thanksgiving time. I'm not sure this photo needs a caption . . . It's always nice to visit with Kyle's Grandma Virginia. She gets to see Grace on Tuesday mornings when there's no school. And it's always been funny that Grace prefers to see her on Tuesday mornings, so she doesn't have to share her with anyone. Grandma Virginia and her kids, minus Aunt Kristy. Just before it was time to open presents, Grace managed to fall asleep in my lap. She's not very good about falling asleep that way, so how she managed to snooze through the chaos is beyond me, but I enjoyed all the snuggles. Her new Minnie Mouse was a hit! We also participate in a gift exchange for the Armour Christmas, and Grace got several new Disney and princess books. She also got a new Christmas ornament for the tree and some paint for the bathtub. Kyle and I got travel goodies and spending money for the entire Armour family trip to Branson next June. We are really looking forward to seeing everyone. I'm not so sure about these two. All too soon, it was time to head for home. Well, Kyle and I had to go back to work, but it meant more fun for Gracie Lou! She got to stay with Grandma Kim and PaPa Randy, and Grace got to go with her cousins to visit Great-Grandma Mary and Uncle Pat. We loved the photos of her hanging out with the two boys, and hated to miss out. Grace hanging out with her cousins at Great-Grandma Mary's house. It was another fun Christmas celebration, and we feel very blessed to live so close to everyone. Christmas celebrations in our family begin well before Christmas, and we enjoy the festivities all season long. Grace couldn't wait to celebrate the Hutson Christmas. The second Saturday of Christmas marks the Hutson family Christmas, which is my mom's side. While the location varies from year to year, we set it ahead of Christmas to accommodate more family members. Mom has seven brothers and sisters, and we want everyone to have a chance to come. Aunt Cathy gave a monologue as Mary, which was very touching. This year's celebration was held at my Uncle Ron's church in Bunker Hill. They have a large multi-purpose room there where the kids can play basketball and run around. After all, there's usually around 50 or more in attendance. Kyle visiting with Patrick and his son, Lane. Grace took a late nap this afternoon, so we arrived just a little before dinner. And even though Aunt Cathy's cookie press cookies were all gone, we still had a great time. The meal is a potluck, with traditional favorites, like cheesy potatoes and veggie pizza, and there are always some new recipes to try too. Kyle's favorite is my cousin Carol's oatmeal cake, and not only does she bring one for the meal, she always brings him one of his own to take home at the end of the night. He's most excited because it's not even something I really like, so he doesn't even have to share! Kyle with his oatmeal cake! After dinner, mom and her sisters usually plan a game or a mixer so people can visit with one another. We usually only see mom's side of the family for Labor Day and Christmas, so there's always lots to catch up on. And Grace was the belle of the ball. She made her way through several family members who wanted a snuggle, and was happy to oblige. Grace giving snuggles to Aunt Mary. Grace giving snuggles to cousin, Marty. Just before the gift exchange, my Aunt Cathy made a special presentation this year. She dressed as Mary, Jesus's mother, and then presented a monologue about her life and how she chose to follow God. It was very uplifting and made me think about answering God's call in my own life, even when it's hard. Grace playing with her Minnie Mouse maracas. And then it's time for presents. 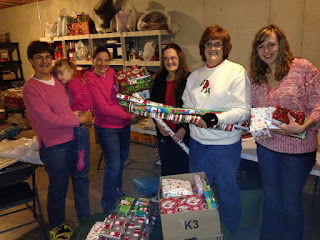 We do a gift exchange, and then my mom and her sisters play Santa's elves and provide gifts for the younger kids in memory of my grandparents each year. It's always one of my favorite times of year when we get together after Thanksgiving to wrap them. It's so much fun to see the kids open up their presents, and then immediately start playing with them. Grace and I helping the Christmas elves get the presents ready. It always reminds me of hanging out with my cousin, Stef, when we were growing up. Grandma Hutson almost always gave us a word search book, and we would sit down with each other and have races to see who could finish a page the fastest. I'm sure that was much more productive than when we had contests about throwing wet toilet paper in the toilets. You might have had to be there to understand that one. I'm not sure which of us is more excited about Minnie Mouse! Before we knew it, it was time to pack up the van and head for home. Although it's hard to say goodbye, we know it won't be long before we see everyone again. Just a photo from our cousins gathering after Christmas! And it wasn't too long . . . since my cousins Stefanie and Jessica weren't home for the Hutson Christmas, we celebrated with another dinner after the holidays. And I loved every minute! Grace was SO excited to help us with her pink house! Earlier this fall, Kyle and I were cleaning up the kitchen, and he asked if we could throw away the Hello Kitty gingerbread house kit that's been sitting on our kitchen counter for the past few years. It was a gift to Grace from my Aunt Anne on Thanksgiving, and like some things go, it just hadn't gotten done. Grace supervised as mommy worked on the sides. Instead of throwing it away, I said, let's keep it through this Christmas. Maybe we will do it this year, and if not, we can get rid of it. As luck would have it, we found ourselves home on a rare evening in December this week, with plenty of time to put it together. When opening up the box, full of pink gingerbread pieces and candies to decorate with, Kyle noticed that it actually only expired in September of this year! We still decided that we probably wouldn't eat it, but had fun decorating it anyway. Uncle Johnny says he still might eat it. . . but we never know about him. All smiles watching daddy add the decorations. I set about opening things up, and gave Kyle the job of kneading the bag of icing. He says I only ever give him the jobs I don't want to do, but I don't see how there's any truth to that! It was such a fun family night! We set Grace in her pink chair and pulled her Minnie Mouse folding table up to it. Although she wasn't able to help, she smiled and grinned as we put it together in front of her. Helping Grace add her own special touches. I was in charge of building the house, and icing, and Kyle was in charge of the decorating. We even helped Grace to add a few decorations of her own at the end. It's certainly not the fanciest house on the block, but it's definitely ours. Our house is all decked out for Christmas. So often, I forget about being able to do things like this because Grace can't help in the traditional sense. But I'm making it one of my New Year's resolutions to do more things like this as a family, because it was the best night we'd had at home in a long time. And I can't wait to see what kind of projects 2016 brings! When Kyle and I were planning our wedding reception, I knew right off that I wanted the bridal party dance to be one of my dad's favorite song's Joe Cocker's "I Get By With a Little Help From My Friends." Because quite simply, the journey is made easier and better with a little help from those closest to us. In this "Grace-Filled Journey," we have made LOTS of new friends who have joined us along the way. Maybe it was a kind word or a text, or maybe it was a new book for Grace. Maybe it was even a new and creative way to raise money for the INAD research study. While we have featured many of these events in our blog throughout the year, here's a few fundraisers and donations from this fall and winter. We are SO blessed by those of you who continue to raise money for this study. Kyle and I have been covering Litchfield football for almost ten years together. In fact, it's really how we met. So, it's no secret that we can be found most Friday nights covering Litchfield High School football together. Receiving a $500 check from the Litchfield JFL team. One September night this fall, school board member and Junior Football League volunteer Ron Anglin asked us if we would bring Grace to the last home JFL game of the season, when the Panthers hosted Hillsboro on a Saturday afternoon. He said they had a donation for us. We were very excited to bring Grace to the game, and they presented us with a $500 check between the seventh and eighth grade games. Throughout the season, they held a raffle with Domino's pizza, and all the proceeds went to the INAD study. Right in line with Friday night football, one of our favorite high school referees, Louis Lang, called Kyle and asked if we could come early to the final high school home game of the season, because local officials had a donation for us. Kyle accepted the check from local referees in October. During October, local officials wore pink in honor of breast cancer awareness month. They decided to donate a portion of their pay to the INAD research study and the Montgomery County Cancer Association in honor of WSMI personality Terry Todt. Lang praised our coverage as well as the radio station's of local sports in this area, and said the referees were proud to support such great causes. Football fans were busy this year with INAD events, and this time it was an American Girl doll raffle at the Hillsboro and Nokomis football games. Earlier this summer, Gena Lewey called to tell me that she and her sister, Andrea Ruppert, had bought the American Girl Doll of the Year Grace, for our Grace. But it just so happened that Grace won the raffle by the queens in July. When Gena read about that in the paper, she called to tell me she had another idea. 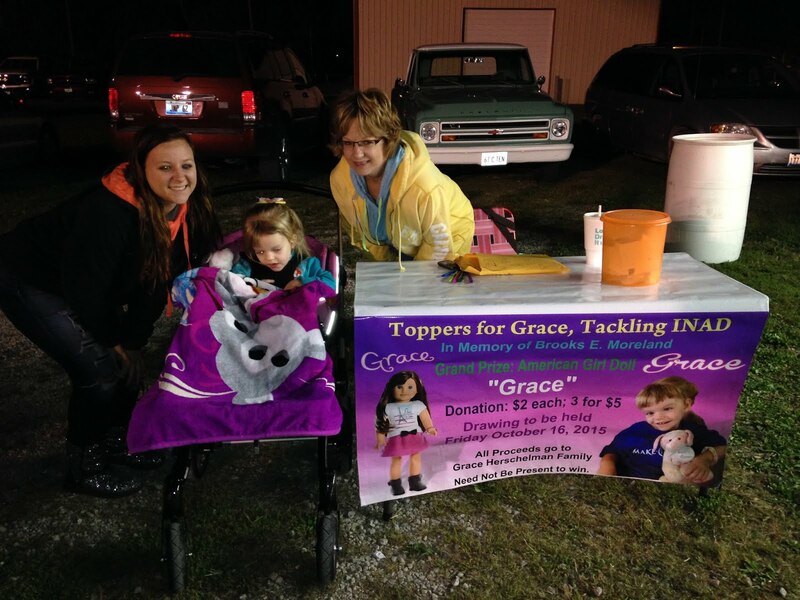 Gena Lewey and her daughter, Cassidy, selling Grace raffle tickets at a Toppers game. She and her sister bought another doll and they raffled off each at the final home football game in Hillsboro and Litchfield in memory of their dad, Brooks E. Moreland. 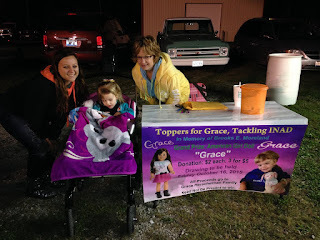 Grace and I even got to go to one of the games in Hillsboro and say hi, and to thank them for their efforts. The dolls were won by Jenna VanOstran and Sarah Eller. Shortly after the end of football season, Gena called to ask me if they could stop by and bring their donation, which turned out to be $1,000. Talk about Amazing Grace. In keeping with the sports theme (because that's how we roll . 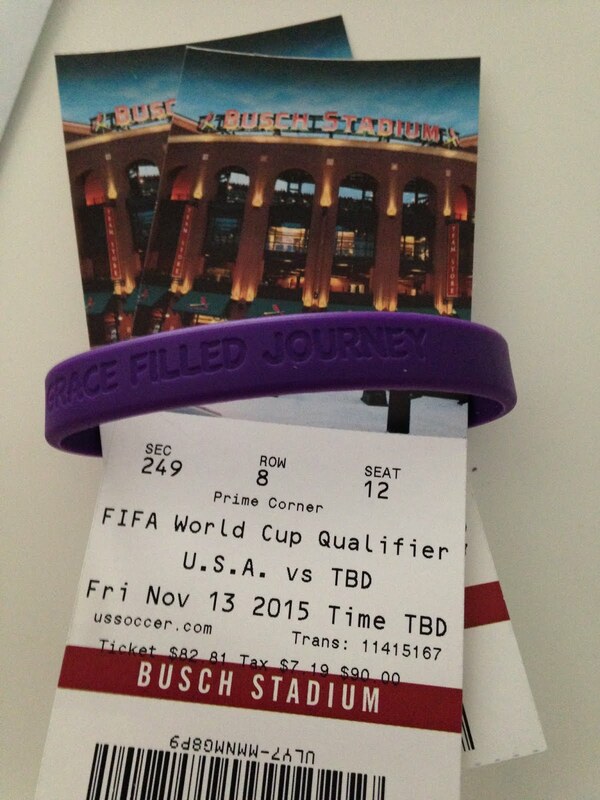 . .), Kyle worked on a raffle for three tickets to the United States men's national team soccer game at Busch Stadium in November. They were donated by one of Grace's physical therapists, Dr. John Mekala in Hillsboro. Grace working hard with her physical therapist, John Mekala. With a little help from 2015 Miss Chamber of Commerce Natalie Elliott, she and Kyle started selling the tickets at the Grace race in September. Then Kyle did a story for the paper and sold some tickets at area high school soccer games. 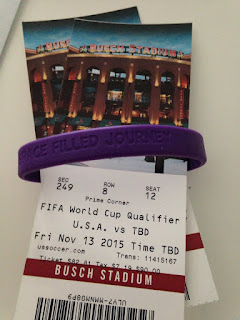 In the end, over 150 tickets were sold, and the raffle raised over $300 for the study. The best part, one of my brother Johnny's classmates, Jake Wilkinson, won the raffle, and couldn't wait to take his family to the game. As fall moved into winter, Kyle began getting sports previews ready for basketball season. He was working on a preview night story for his alma mater, Lincolnwood, when he learned they were donating to the INAD study. Grace hanging out with her favorite cheerleader at Lancer Preview Night. Typically, admission to the preview night is a donation of shampoo or Gatorade to the team. This year, they added a donation to the INAD study, and raised more than $300. 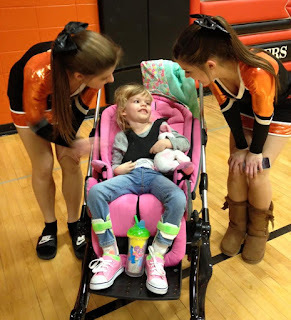 I was busy that night, but Kyle and Grace got to go and had so much fun cheering for the team and visiting with Grace's favorite cheerleaders, Kayley and Kensey. I was sitting at a school board meeting this fall, and the Student Council President reported that the FCCLA was raising money for the Herschelman family this year by doing a variety of fundraisers and working concession stands at the ball games. I turned to ask one of the administrators if I had heard right. She said I had, and I just smiled. Shortly thereafter, I got an e-mail from their instructor, Mrs. Garrison, asked if we would be willing to bring Grace to one of their meetings, and we happily agreed. It wasn't a night that Kyle could join us, but Grace and I had such a good time sharing our story with the students and answering their questions. They even gave Grace a whole bag full of goodies, including two new Minnie Mouse stuff animals she can hold, a couple of board books and some DVDs to watch in the van on the way to physical therapy. They also gave us a check for $100 for the INAD study and $100 for Grace. We were so honored to come that night and meet the kids. At the last school board meeting I attended, I learned they sold candy canes at Christmas for another fundraiser for Grace. They adopted us for the whole year! You'll read more about this one in the coming weeks and months, but the Litchfield High School Student Council is selling temporary license plates featuring "A Grace-Filled Journey" logo. We are SO excited for this opportunity to help raise more awareness for INAD too. The plates are $30, and will be legal to put on Illinois vehicles from the end of February through April. On our two vehicles, we got BEAT and INAD. They will have a presentation of the donation to us at the county baseball tournament later this spring. You won't want to miss out on this one! 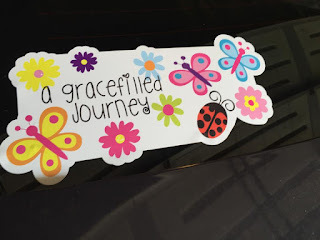 And speaking of vehicles, The Vinyl Guy in Raymond has made custom "A Grace-Filled Journey" vinyl decals for your vehicle. We are fortunate to have one for each vehicle, and so far they have raised over $300 for the study. The decals are $10, and are available at The Journal-News office in Hillsboro. As a special treat, we found out after Alexis Wernsing died that she had ordered a decal, and her mom and dad brought it to us to have. Even better, it has written Jeremiah 29:11 on it, which was her favorite scripture. It's become very special to us too. Shortly after we returned from Hawaii this summer, we found out that a local resident had put together a cookbook and was giving part of the proceeds to the INAD study. Kathy Trader said she had compiled over 400 of her family's favorite recipes. It was more reasonable to order 200 copies of the book, than just enough for her family, so she ordered extras. We bought one and asked her to autograph it for Grace. Kathy Trader brought in $350 from the sale of her cookbooks. Over the weekend, she and her husband sold the cookbooks at a Christmas Market vendor event, along with some Christmas ornaments he decorated to say "A Grace-Filled Journey." We got a purple one for our tree. Kathy brought us a donation of $350 for the study. We were so surprised! She said she still has a few cookbooks if anyone is interested, and we love ours! I know I will probably miss some, but we just want to say THANK YOU to everyone who has donated to the study. This morning, Grace and I went to the courthouse (and not because Kyle was arrested), but the Circuit Clerk's office had a $160 donation for us. They hosted a jeans day every Friday throughout the year, and employees could make a donation to wear jeans on that day. I'd probably be in trouble if I had to pay every time I wore jeans to work, but we sure are grateful for the donation to the INAD study. Grace and I with the staff from the Circuit Clerk's office, and they gave us $160. And just this week, our friends Jen and Adrian Baker of Diamond Imprints told us they were making a donation to the study from their business. Each year, they donate a portion of the proceeds to a charity, and this year they are giving half to Special Olympics and half to INAD research. How awesome is that! Although we took $70,000 just three weeks ago to Dr. Kotzbauer, we already have $4,000 again building up in that account, and we continue to learn of more fundraisers all the time. Please know what a difference this makes in the families of all the kids with INAD, and we are SO grateful to "Get By with a Little Help From Our Friends."